Although Art Ross is primarily remembered as an executive with the Boston Bruins hockey club, he is a member of the Hockey Hall of Fame not as a builder, but as a player. Ross was born in Naughton Ontario, but grew up in Montreal Quebec where he also began his hockey career. Before the National Hockey League existed, the Stanley Cup was a trophy that allowed teams to challenge for the championship. Art Ross won a Stanley Cup while on loan to the Kenora Thistles in 1906-07, and enjoyed a second celebration with the Montreal Wanderers the next season. He played in the National Hockey Association with Haileybury, Ottawa and the Montreal Wanderers for eight seasons, but when the Wanderers joined the National Hockey League in 1917-18, Ross was with them, playing defense. Unfortunately, fire destroyed the Wanderers' arena, and when the team withdrew from the league, Ross retired as a player, having played just 3 NHL games. Art Ross was named coach of the Boston Bruins in their inaugural season (1924-25), and won three Stanley Cups with them before moving into the general manager's chair. In 1945, the Hockey Hall of Fame named its twelve chartered honourees, and Art Ross was one of them. Leading winners: Wayne Gretzky (10), Gordie Howe, Mario Lemieux (6), Phil Esposito, Jaromir Jagr (5). 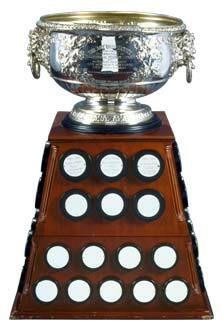 In 1947, Art Ross donated a trophy to the NHL, which would be awarded to the player who led the league in points scoring during the regular season.